SubRosa - a community space: Tonight! A Show! // Sun. Prisoner Letter Writing & Rojava 101 // Tues. A Reading Show + // & More! Tonight! A Show! // Sun. 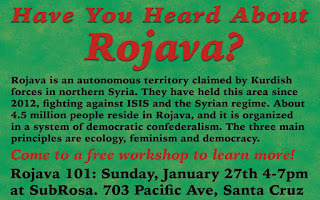 Prisoner Letter Writing & Rojava 101 // Tues. A Reading Show + // & More! -Sunday, Jan. 27th, two happenings! 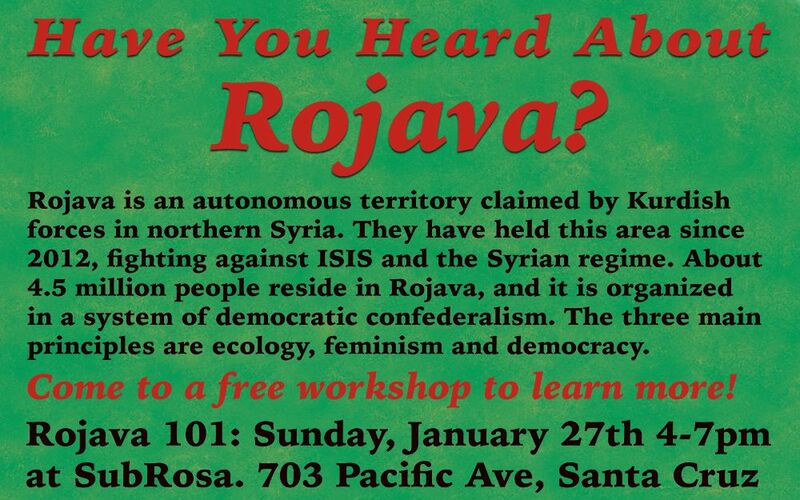 Rojava is an autonomous territory claimed by Kurdish forces in Northern Syria. They have held this area since 2012, fighting against ISIS and the Syrian regime. About 4.5 million people reside in Rojava, and it is organized in a system of democratic confederalism. The three main principles are ecology, feminism, and democracy.